There are countless varieties of gluten-free Christmas cookies you can make to keep your sweet tooth satisfied this holiday season. A number of Christmas favorites are naturally gluten-free, while others are easily modified to become new family traditions. These cookies are a deceptively easy recipe that can be made gluten-free with a minimum amount of modification. 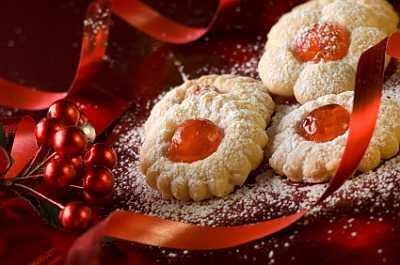 This recipe makes about three dozen small cookies - enough to feed family as well as company or to portion into homemade gift baskets. Mix well. While mixture is still warm, drop teaspoonfuls onto wax paper and chill until firm. The longer you cook the chocolate mixture before adding the oats, the firmer and crumblier your cookies will be. Many recipes for rum balls demand the use of crushed, wheat-based cookies. Instead, this recipe uses icing, sugar and ground almonds as a base, resulting in a taste actually superior to other rum balls. Combine dry ingredients in a medium-sized mixing bowl. Add vanilla to rum and stir into dry mixture a little at a time until a soft dough forms - about 1/4 cup. Put the rest of the vanilla-rum mixture aside and chill dough 30 minutes. Use your hands to roll the dough into grape-sized balls and return to refrigerator for another 15 to 30 minutes. While balls are chilling, prepare your coatings. Choose from desiccated coconut, gluten-free chocolate sprinkles, crushed peanuts or almonds, cocoa powder, powdered sugar, or whatever whets your appetite. Dip each rum ball briefly in rum and vanilla mixture, then roll in your chosen topping to cover. Tightly sealed and kept in the fridge or freezer, these cookies will keep for up to a month and may even improve in flavor over time. Can't imagine a Christmas season without shortbread? No problem. Gluten-free flours like rice flour or arrowroot flour suit the delicate texture of shortbread perfectly, making gluten-free shortbread a natural option. Line a cookie sheet with parchment paper and preheat oven to 350 degrees Fahrenheit. Whisk together cornstarch and all flours. In a separate bowl, beat butter until fluffy. Add confectioner's sugar and mix well. Gently stir in flours mixture, salt and vanilla extract. Drop by spoonfuls onto cookie sheet and top with gluten-free maraschino cherries. Bake 15 to 20 minutes, until bottoms are lightly browned. There must be something about the festive season that inspires gluten-free chefs everywhere, because there is no shortage of recipes for gluten-free Christmas cookies. For more great baking ideas, try any of the tempting recipes at Gluten-Free Gobswacked or Cookies-In-Motion. Alternatively, if you are feeling creative and adventurous, simply choose a favorite traditional cookie recipe and experiment with gluten-free flours to create a recipe all your own. Even if you turn out a few flops before attaining the perfect batch, the learning process gives you experience with gluten free baking that will benefit you for years to come. The taste-testing phase of all that learning is, of course, just a bonus.